Over the past few weeks I can say one thing is for sure. I have been riding an emotional roller coaster. It all started "That Day". I have written about that so I wont go back to it because I have explained as well as I could how I felt. Emotionally, none of this is getting easier. God is so amazing though. HE is ALWAYS there. HE gives me strength when I am weak. HE gives me hope when all is gone. HE also gives me my wonderful wife when I cannot do it alone. Then, when all else fails and blue is the only color I can fabricate to tell you how I "feel"; Steele is right there, smiling, saying dada, bubbles, thank you, throwing balls, begging to go outside, and best of all, when Steele gives that hug that only Lindsay and I can tell you about. Lindsay talked about Dallas, and I want to give you a little bit of what I felt. I wasn't as nervous or full of anxiety or even the least bit afraid of what they might tell me. In fact I WANTED THEM to tell me something DIFFERENT. As you read in Lindsay's blog though, they really didn't tell us anything we didn't know. Lindsay was overcome with emotion that day. I was filled with ANGER. The longer the day went, the bigger the animosity became. Not at God, not at the doctors, not at me or Lindsay, not at anyone really. I was just MAD at something or better yet, EVERYTHING. To have a doctor tell you that your son looks great. He is so smart. He has the BEST prognosis. Then, look at you and basically tell you that you have to be ok with possibly outliving your child. A doctor had just told me his prognosis is GREAT, these "kiddos" are living into there 20's, 30's, and 40's all I could think was.... WHAT? How is THAT great? I remember looking at Lindsay when they said that. I was dumbfounded. Having said all of that though, we did have a wonderful experience there. Everyone was nice and really genuine. I just wish they could say that different, or not at all. I know it bothered Lindsay because her phone call after we got into the car all but spelled it out. I just remember thinking my wife and my mom are really upset, GOD give me the strength to be strong. I still had to call the other parents and grandparents. So I did. For fear of upsetting everyone in the car again, I simply said we didn't learn anything new. I think after a few seconds my dad got it. He said ok... I will talk to you later, but not before a wait... what did... nothing.. I don't understand. It was a long ride home. I was Mad. Next came Christmas and boy did we have a good one. We bought Steele waaaaaaay to much, and Santa BROUGHT him waaaaay to much. We had our first Christmas in our house. We had a lot of fun with family and Steele got to play with cousins. I am pretty sure the first Adalyn/Steele/Shep sandwich was created at one point. They had a blast. At one point the joy disappeared for me. I was watching the kids play. Adalyn and Shep were bouncing around going from here to there, and Steele was just watching. I know Steele is so smart. I know he was trying to figure out why he couldn't do what they were doing, but I quickly prayed to God to release that. He did. Joy came back into my heart. The only part I guess I wish I could have changed was this next sentence.We didn't get to go to Arizona. We had plans to, we wanted to, but we would have to drive, because it was just too risky flying during flu season. We did get to Skype. We found out Steele is going to be another cousin. Aunt Lacey and Uncle Banks are pregnant!! THAT is amazing! We cannot wait to experience that with them. This is where I feel like I need to thank a few people for the things they have done. First our family has not only been there, but they have gone above and beyond what is expected. My Mom has helped more than we could have ever asked for. She has been there when we needed someone to keep Steele on a schedule and at the last second. Momma Kim (Lindsay's Mom) has sent money for us to stay in hotels when we go out of town for visits. Her Grandparents and Aunts and Uncles have sent money for extra expenses. Aunts and Uncles have sent care package after care care package to keep not only Steele entertained, but just so happens I enjoy blowing bubbles and playing the games too. I just cannot fit into the little clothes at this stage in my life. My Dad has done anything and everything to do the same. My Grandparents, my second parents Doris (Stepmom) and Jim (Stepdad), and basically all of my family. I would also like to take a moment and thank Gretchen Kovac. She along with Alex Hayward, Vicki Fletcher, Paul Stephenson, and the rest of the homebuilders association have created an account for Steele at Progressive Bank. They are also helping raise money at the home show for Steele too. My family has also opened an account at Regions Bank. We will also be auctioning off a kitchen at the Home Show at the Civic Center. The kitchen or cabinets will be worth $10,000.00 dollars. The raffle will be decided by the homebuilders. For more information contact me at Beau_Becton@yahoo.com . We will be making T-Shirts to sell. Rodney Noland came up with the design that I explained to him over the phone that came out exactly like what I had envisioned. Reflections, who will be making the shirts is also donating .50 cents per shirt sold. 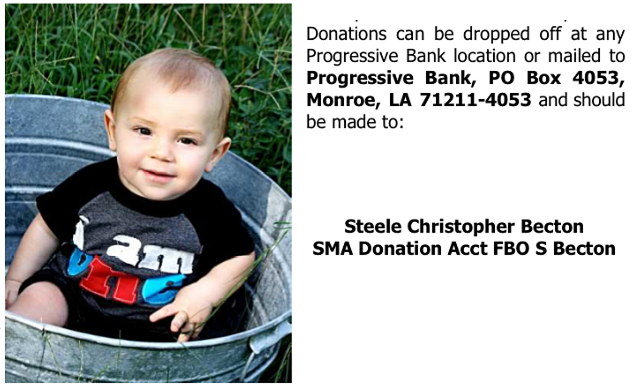 Steve Sills along with many of my family and many others also made donations for Steele and we thank them and everyone else who has, plans to, or just says a simple prayer for Steele. I CANNOT express the gratitude I have for these people. I know I have forgotten names but I have not forgotten you. Thank you. We also bought a new Toyota Sienna, and without my Dads help, it would not have been possible. Well I say that, but... I guess I have to say the one we bought would not have been possible. We had a van picked out. With down payment and rebates, we were right about where we were with the car as far as payments go. The Monday before we bought the van, I received a fax with the van we had picked out. Before I read the fax, my dad saw the fax and asked me if that was the van we were getting. I said yes. He said no it isn't. He pleaded with me to please let him help us purchase a van that Steele could enjoy. My dad talked to Doris then gave me a raise to cover the rest of the monthly payment that we not have been able to afford. So... We ended up getting a van with a few more "nice" things to accommodate Steele now and in the future. We didn't want any handouts. We still don't. We are greatly appreciative of the things that people are doing for us. So, today, I thank not only my family, but everyone. We thank you for thoughts, for prayers, for donations, and for any contribution however it is made. God bless. I thought I had the strength. God is always there, but I thought God had given me enough to overcome any defeated feeling. Sure, I have had and still do have moments that THIS is extremely hard, but for the most part, God gives me the strength. We had Steele's check up with his Neurologist. The whole day I knew it was coming. I couldn't stop the anxiety building. I was going back to the place where this all began. I was going back to sit in the same office where the doctor looked me in the eyes and told me Steele had Spinal Muscular Atrophy, and that he would most likely never walk. Then, in a split second thoughts became reality. We drove up to the building, I parked in the same spot, I walked through the same doors, sat in the same seat, and waited. I held back my tears. I would look at Lindsay and then at Steele and realize what God have given me. Then we were called back. We walked into the same room, they did they same measuring, weighing, questioning, and then we waited. I cannot even give you the word to describe what was holding back my emotion. I just hugged Steele has he played with the head measuring tape. The Doctor came in and was SOOO IMPRESSED with Steele's progress, then he was SOOO IMPRESSED with his intelligence. He even called him Dr. Steele, and said THAT was his NEW name! He called in his assistants and bragged on and on about Steele. Confirmation that I thought he was smart. But yet I was STILL crushed. Lindsay and I pray every night for divine healing. We pray for God to give man the ability to produce a cure. We pray for friend's and family's health and well being. We pray for specific people and situations that we know of and we also ask God to help those who we don't know. We put Steele to bed after hugs and kisses. Lindsay walks out of the room. That is my special 5 minutes with Steele. I put my hand on his back or tummy. I lean over his crib and I talk to God. "God let my hand be an extension of yours, heal my son like you would your own for he is your own, I ask you God to let my son walk in the light mentally, spiritually, and physically to do your will and spread the good news. If it be your will, let it be done. I am merely Steele's earthly father, for you are mine and his in heaven, so I bring the faith of the mustard seed to you tonight, and tell you as you have given me the ability to do even greater things through you than Jesus did, to take this abnormality in my son, and make him whole in your image like YOUR SON Jesus. In Jesus Name, Amen." Let us know when t-shirt sales begin!!!! !